Home Bonsai What are Bonsai Tools? Bonsai tools are specialized tools to care for and cultivate the Bonsai trees. 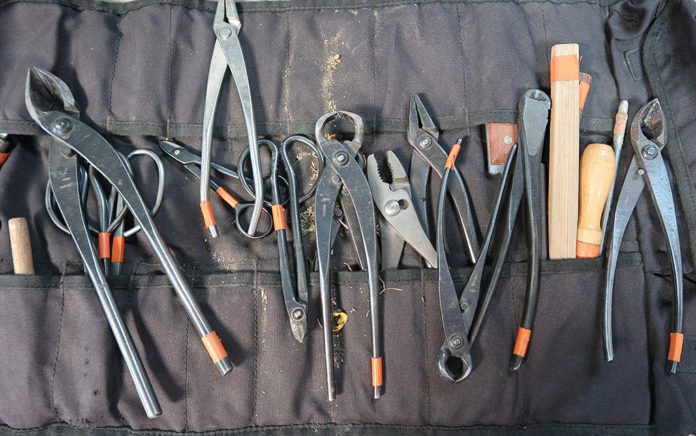 These Bonsai tools are used to trim, shape, and care for the Bonsai Trees. The Bonsai tools are used to prune, bend, trim, and maintain the Bonsai Tree. There is an abundance of Bonsai tools that range in quality from beginner use to professional grade. Bonsai tools include shears, cutters, root and wire cutters, training wire, rakes, and branch benders. Below is a list of the most common types of Bonsai tools used. Concave Cutter-This is the one of the most common and important Bonsai tool since it is designed to remove or crop the branches or roots without leaving a stub. It also causes less damage to the Bonsai Tree, allowing the wound to heal faster. Spherical Knob Cutter-This cutter is designed for deep, clean cuts close to the trunk of the Bonsai Tree. Root Cutter-This Bonsai tool is similar to the Concave cutter, but it is designed for pruning roots during transportation or repotting of the Bonsai Tree. Butterfly Shear- It’s called a “Butterfly” shear because the handle is shaped like a Butterfly. Many people consider this shear the most famous Bonsai tool because of its powerful spread angle handle and ease of use due to having very large handle space for your fingers. Twig Shear- This shear is very similar to the Butterfly shear, except it is much more slender towards the blades so it is easier to trim and prune deeper in the Bonsai Tree. Azalea or Satsuki Shear-This shear is much smaller than the Twig or Butterfly shear as it is used for the finer pruning and trimming finishes of the Bonsai Tree. Bonsai Root Hook-This is a Bonsai tool used during potting or repotting of the Bonsai Tree. It is very efficient at loosening the soil as well as separating the branches and roots in order to pot/repot the Bonsai Tree. Bonsai Rake-The rake along with the Root Hook are very useful Bonsai tools in moving the soil and roots in potting and repotting of the Bonsai Tree. Bonsai Branch Bender/Bonsai Jack-This Bonsai tool is used to add more bend or sway branches or trunks in the Bonsai Tree. Training Wire-This is used to bind branches and roots so they would grow in a certain manner and a give the Bonsai Tree its own distinct look. Wire Cutter-This Bonsai tool is a regular wire cutter, except the head of the cutter is round, this allows the wires to be cut clean, while leaving no marks or damage on the branches or roots of the Bonsai Tree. Grafting Knife-This knife is used to prune and make the final small precision trims of the Bonsai Tree. Pruning saw and Locking Blade-The pruning saw and locking blade is simply a small hand-sized saw to prune and saw off any small branches that you want to trim off inside the Bonsai Tree. Hemp Broom-This Bonsai tool allows you to quickly clean up after you prune. It is also used for maintaining the trunk and grounds of the plant.